Are you ready for Blue October to rock you to the core? 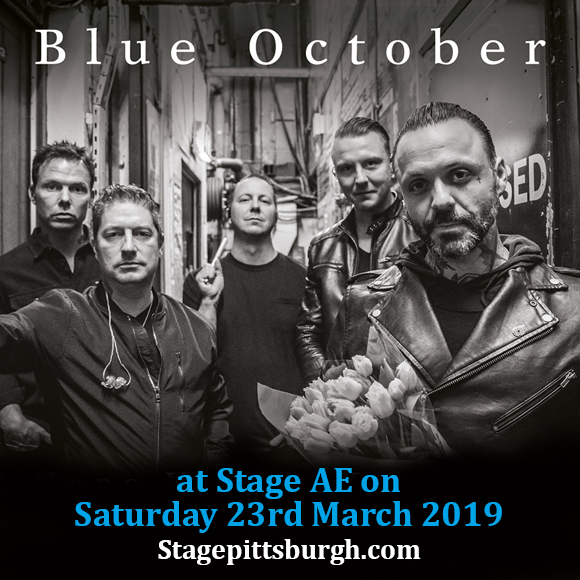 The band's major hits like "Into The Ocean" and "Hate Me" are reason enough to get fans into a state of frenzy and troop to their upcoming show at Stage AE on Saturday 23rd March 2019. Time and time again, Blue October has rocked to a full house. The band, as well as their rabid fans, show no signs of slowing down. Tickets sell briskly by the minute. If you don't act quickly, you'll surely miss this helluva rockin' show. Now go — get your tickets in a flash! The mid 90's to 2000's alt-rock scene was hotbed that erupted post-grunge, alternative rock bands. Blue October was one of the many bands that came out, but they're undeniably one of the chosen few who created an impact, a force that shaped the face of rock music as we know today. Founding member, lead vocals and guitarist Justin Furstenfeld and violinist Ryan Delahoussaye are the band's core members who got together in Houston, Texas, recruiting its original member line-up which include: Jeremy Furstenfeld on drums, bassist Matt Noveskey, and lead guitarist Brant Coulter. Their 1998 debut album "The Answers, was a moderate success but it earned the band a loyal fan base, and got the attention of major labels which brought about the release of their sophomore album "Consent to Treatment." The album gave them another taste of success but still not enough to sustain support from their record label. Not one to back down, the band persisted and at the onset of the year 2000, their top 40 hits like "Hate Me" and "Into the Ocean," plus groundbreaking appearances on Jimmy Kimmel Live and The Tonight Show with Jay Leno, gave them enough exposure to fans that propelled them to the high altitudes on the alternative music rock stratosphere. The band has spawned eleven top 40 singles from they seven studio album releases. As they brought on the hits, Blue October continue to attract large crowds up to this day. You've been warned, Blue October fans are not taking this announcement sitting down. The action starts the moment tickets are released and the demand has been coming in non-stop. Nothing's gonna stop you now. Go, book your tickets as fast as you can!